James Taylor's first album. Notable also that this was the first non-Beatles album recorded on the Apple label. Obi:Replica Apple obi wraps around the top similar to the original vinyl obis. Gatefold. Glossy outer, matt inner with lyrics. 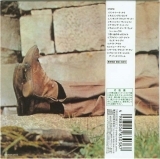 CD and insert slip out into the inner of the gatefold (as pictured). 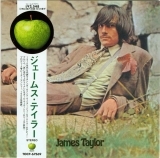 Colour photograph of James Taylor by Richard Imrie / J.B.A. Lyrics:Japanese and English on medium weight 2 by 5 black and white glossy paper.